Some of the largest trusts in the country use Every. As a method of effectively scaling your trust, Every is proven to work every time. The system is specifically designed to be user-friendly so that every school in your MAT can get the best out of it. It also means that the trust office can provide effective oversight and support without an army of officers. You can be reassured your schools are keeping on top of their compliance, assets, maintenance and procurement with Every. All schools in your MAT can achieve results with Every Compliance Management. We provide your trust with central oversight whilst responsibilities are made simpler within your academies. 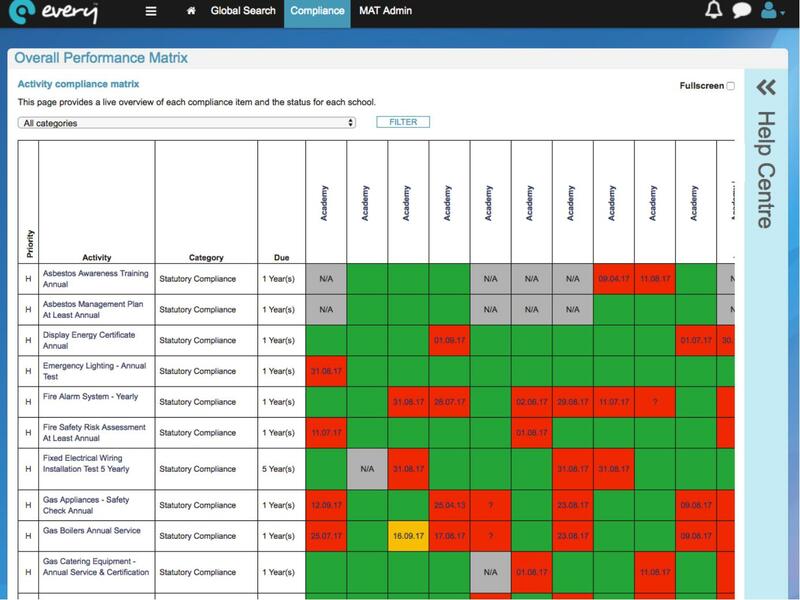 Set compliance categories and tasks centrally, push tasks to each schools and quickly see which schools are excelling and which may need support with the Every RAG dashboard. Whether you're managing a group of small primary schools or large secondary schools, Every Compliance Management provides you with the ability to embed consistent and sustainable working practices across your schools, have central compliance oversight and manage all your operational commitments across multiple sites. All schools in your MAT can achieve results with Every Business Management. We provide your trust office with central oversight whilst responsibilities are made simpler within your academies. See which schools are excelling and which may need support with the Every trust dashboard. Whether you're managing a group of small primary schools or large secondary schools, Every Business Management provides you with the ability to embed consistent working practices across your schools, have central compliance oversight and manage all your contracts and maintenance across multiple sites. Whether you're a small 50 pupil primary or a large 1,000 pupil establishment the Every system has something to offer you. Every has modules that cover the key areas of operational management in your school. Business Management includes modules for managing contracts, compliance and issues. Asset Management helps you keep on top of your assets and plan for replacement kit or reduce your insurance premiums. Request for Quotes is all about getting best value from competing suppliers in a very short time for minimal effort. The user has a dashboard view of all the schools in the trust with key summaries for each which helps to identify the schools that need support sooner. It also helps ensure consistency in working practices and the system helps with automated weekly email alerts for both school managers and trust officers. As a trust the system helps leverage economies of scale by converging school contracts, reduce insurance costs with up to date asset registers. The system also allows you to record condition data for support capital bids and the effective allocation of funds. The Every systems were designed with school business and facilities managers in mind. It’s all about making your busy day easier and noticeably improving results. Your role encompasses so much, from finance to facilities. With a three-month horizon of upcoming activities, email reminders and alerts when issues have been assigned or updated, you stay in control. Your team know what they’re doing and when they’re doing it, allowing you to focus your limited time on more important things. Certificates, photos, quotes, supplier contacts can all be uploaded, stored and accessed whenever you need them. As well as this, prove your capability to heads, governors and inspectors with instant reports on everything from reactive maintenance to your contracts expenditure. The unsung heroes of schools, a lot of the work site staff carry out is invisible but with Every the profile of the site team is raised and enhanced. Reduce those inconvenient corridor conversations by viewing all issues that have been logged in one place, making it easy to prioritise jobs. Add notes or a photo to let your colleagues know what was done and when. No job is forgotten with automated alerts means you don't miss anything. Don’t use a computer? No problem. Lists of daily or weekly jobs allocated to you can be printed for you to tick off and your office team can update the system in minutes. Site managers say is buys them more time on jobs, priceless! Teachers are focussed, rightly, on the classroom so sending a pupil out of class to report a problem to the Business Manager, or grabbing the one of the site team in a corridor, or remembering to write in the log book in the staffroom isn't an efficient way of logging a problem. With Every a teacher can log the problem from the classroom in seconds either on their computer or a mobile device. Teachers, if they wish, can receive alerts on their issues so they're kept in the loop. We know that you would rather be focusing on quality teaching and learning in your school, not premises and operational management. Helping your support staff to manage things better can make all the difference to their and your working day. Empower and support your business manager and site staff with Every. It offers the reassurance and oversight whilst enabling you to delegate easily to your support team. As head teacher, you can log-in whenever you need, accessing key information from home, work or from your mobile device. We believe that a great learning environment leads to better opportunities for children. Governors are increasingly responsible for the overall effectiveness of the school including the Health & Safety aspects. With Every, Governors can be reassured that the fundamentals of the operation of the school are well run. Schools can evidence their compliance and management of risk along with the financial management of the maintenance. Easy to produce reports, in a consistent format, make it easier for governors to see progress on compliance tasks, recurring problems that may require capital investment, or a list of quotes from the Request for Quotes module for a large purchase.